Our resident expert in everything Arkham returns to review a new (if repurposed) book on the fabled press. John D. Haefele certainly burst fully-formed on the scene with his A Look Behind the Derleth Mythos, but he’s done a ton of stuff on the subject, most recently a run of articles appearing in Crypt of Cthulhu. See his Amazon page for a thorough list of books, chapbooks, monographs, web and print surveys. He knows the turf. Arkham House remains the most significant small press in the history of weird fiction, and its legacy remains imperishable. It has inspired legions of other small presses to take up the work of publishing the leading luminaries in this field, and for that alone it will deserve to be remembered. Considering that Joshi at every opportunity—for more than four decades—has spent his time maligning Arkham founder August Derleth (among the legion of opinions, citing his “incompetent and error-riddled editions of Lovecraft’s work”), his current verdict for purposes of this book seems. . . perhaps “generous” is the word? In 1939 Derleth and his co-founder Donald Wandrei published the first Arkham House: The Outsider and Others, by H. P. Lovecraft, but for most of the years before his death in 1971 the press was a solo operation by August Derleth. He paid the bills—which greatly exceeded publishing income—wrote all of the promotional materials, did bookkeeping, shipping and handling of orders. His vision initiated all of the innovations and successes for which Joshi praises the publishing firm in his nine-page introduction. During his tenure, Derleth launched two additional imprints that complimented Arkham House: Mycroft & Moran and Stanton & Lee. Taken together, the books published with Derleth at the helm—what we Arkham collectors refer to as the Classic Era—dwarf everything that came after his death, often dubbed the Modern Years. The effort Joshi put into this new book, however, seems to be wanting. After admitting the book’s “inevitable” resemblance to Sheldon Jaffery’s Arkham House Companion (1990)—one book listing the contents of an Arkham being similar to another book also listing the contents of an Arkham—Joshi reiterates from his Sixty Years preface that he compiled all information “independently.” Strangely, despite listing the book in the reference bibliography included, he doesn’t refer otherwise to Leon Nielsen’s Arkham House Books: A Collector’s Guide (2004), the most recent such reference after Sixty Years of Arkham House. Likewise, Joshi repeats that he is the first to include the contents of the house magazine Arkham Collector (1967-70). Joshi apparently forgot that I compiled exactly the same detailed list in 1997 in The Arkham House Supplement: Bibliographical Additions, Comments, Marginalia (on pp. 82-87), right before he released Sixty Years. The Supplement was my first book, I suppose, in a run of only some 45 copies, most of them distributed to the membership of the Esoteric Order of Dagon amateur press association. Joshi was the compiler for EOD mailings at that moment, so all the submissions went through his hands. Eighty Years picks up right where Sixty Years leaves off—yet, even including items without assigned numbers, Joshi adds to the tally of the three major Derleth imprints only 13 books. Especially since this grand total represents only six more books than Leon Nielsen listed in his guide. Six. Nielsen’s 240 entries against Joshi’s new total of 246. Such small numerical advances hardly seem to warrant new books. Even if Joshi did compile every iota of even his newest information “independently”—and was lucky enough Arkham House/Mycroft & Moran/Stanton & Lee managed in combination to publish 13 more books—the worth of such a bibliography is in the asides, the deep knowledge that may be imparted to the prospective Arkham House completist. Joshi ignores most of the charming items of Arkham House ephemera, the stock lists and brochures that drummed up orders to keep the company afloat. The only published sources on these items are the 1985 chapbook The Phil Mays Collection of Arkham House Ephemerae released by the bookseller Roy Squires, and the greatly expanded “Arkham House Ephemera: A Checklist of the Classic Years” Don Herron complied for the October 2002 issue of Firsts: The Book Collectors Magazine. Any book that purports to combine history with a bibliography of Arkham House, given today’s interest in the publisher, leaves the job half done if it doesn’t include the hundreds of booklets, brochures and other advertising items, always chock-full of original “autobiographical” material in terms of the life of the press. The closest Joshi comes to acknowledging the ephemera is the handful of pieces he incorporates into his primary Arkham list, which—unlike most printed ephemera—were issued with intentions that they would be of lasting significance, because they fulfill some sustained reader interest. Taking cues from Jaffery, Joshi includes exactly the same ones: Derleth’s bibliographical Years of Writing chapbooks, and the AH 1939-1964: 25th Anniversary booklet. Except, Joshi demotes them, removing Jaffery’s separate ID numbers. His explanation? “Not part of the Arkham House list.” One wonders why they show up in his book, in that case. Joshi likewise “un-numbers” Lovecraft’s Autobiography [:] Some Notes on a Nonentity, a chapbook traditionally stamped with the publisher’s imprint, and offered for sale in Arkham’s regular Stock Lists as a limited release. Neither did Derleth number this item in 1969, but Joshi misses the opportunity to delve into possible reasons. Also lacking separate numbers are both versions of Lovecraft’s The Shunned House, an attempt made by W. Paul Cook in 1928 to release what would have been Lovecraft’s first book. The pages had been printed and organized into signatures for binding, but the project fell through. While some experts understandably relegate the unbound House signatures to a non-Arkham status, no expert worth his salt categorizes as less than full status the bound edition that has “Arkham House” printed on the spine. Derleth’s edition was the first time any of the surviving sheets were bound commercially. Sixty Years had adequately covered the period when Jim Turner acted as editor for Akham House—Turner probably signed that book’s contract with Joshi and afforded him insider access to company records. But the more recent intervals, with Peter Ruber as editor, followed by the team of Robert E. Weinberg and George A. Vanderburgh (whose name Joshi misspells throughout), are responsible for every one of the 13 new titles we find in Eighty Years. Not surprisingly, Joshi gives them short shrift. Joshi’s Baker Street Irregular entry (at this writing Arkham’s last book) is complete—he identifies both limited printings, the “Presentation” and “Author’s” editions—but for Vanderburgh’s 17 lettered Shunned House Facsimile copies, each with a pasted-in pocket holding a rare unused signature from the actual 1928 printing, there’s not a word. In addition, Joshi inexplicably assigns a single number to four different collections of Derleth’s weird tales promoted by Vanderburgh in 2009 as “The Macabre Quarto”— though not necessarily a set, each could be purchased separately. (Nor does Joshi indicate that all of the Quarto books were available in limited hardcover editions, as well as softcover.) The result of this single entry is more ambiguity. Nor is this combo-entry much different than if Joshi had included his own “pure text” series of Lovecraft volumes in the Jim Turner era as one unit, per the pre-release “The Arkham Lovecraft” hype. Joshi listed 19 entries for Mycroft & Moran in his 1999 bibliography, which Nielsen upped to 20, which is where Joshi left it. If he had done the homework—perhaps contacted George Vanderburgh—he could have added the ten Steve & Sim titles George published under the M&M banner 2001-2010, and even some later collections featuring Carnacki and Dupin. More than doubling the ranks of post-Sixty Years releases. One wonders how “independent” Joshi felt he had to be if he didn’t interview the last living Arkham House editor. Stanton & Lee, alas, is more neglected. Total books add up to 16, same as in Sixty Years—same as Nielsen. And once again two S&L books from 1971 left out of Sixty Years are omitted: This Undying Quest, by Grant Hyde Code, and Night Letters, by Francis May. Joshi is barely phoning it in. Checking the list of the “Lost” Arkhams—proposed titles that never saw print from the press—Joshi’s new list is Jaffery’s list. Both, if one looks closely, name 62 of these lost titles, if you include several titles Joshi kept from Jaffery, but only in small print and without his separate number. Besides this, Joshi finds several mainstream Derleth titles to add, but deducts an equivalent number of what he deems “minor title variants”—inconsequential categories, but which offset each other when it comes to counting. What is consequential is that Joshi’s “Lost” list lacks important additions he should have listed, including such provocative titles as Ghost Stories by R. H. Malden, Collected Weirds by Fitz-James O’Brien, a Selected Tales of Lord Dunsany omnibus, The Gargoyle by Marjorie Bowen, and a Farrar, Straus & Young sci-fi anthology titled Morning Stars. Personally, and making use of only published records, I could have added a baker’s dozen lost titles—at least. And at eighty years after the birth of the press—beyond updating what was already there—why not a list of publishers that were so influenced by Arkham House they chose to carry on, for a while, where Derleth left off? Why not direct the Arkham bibliophile to Mirage, Carcosa, Whispers Press, Fedogan & Bremer, and others? One might make the case that the Joshi-affiliated Necronomicon Press and Hippocampus Press fall into this tradition. Simple lists, easy to populate. A trove of hard data. How nice it would be to have it all in one place. Instead, exploiting a benchmark opportunity apparently to make a buck. Once again leveraging Derleth’s reputation. At least Joshi got that part right. You know Terry Zobeck, if he notices some ref to Hammett he considers “off,” he’s on it like a dog on a bone. He spotted just such a remark in the obit for David Fechheimer. As Don deduced, Lawrence Block sent me the New York Times obituary for legendary PI David Fechheimer, knowing I’d be interested. As the obit notes, upon finishing The Maltese Falcon Fechheimer applied for a job with Hammett’s old outfit, the Pinkerton’s. He was hired for $2 an hour. He had a life-long interest in Hammett, conducting some ground-breaking research into his life. Most notably he tracked down Hammett’s wife Jose Dolan Hammett and conducted the only known interview with her (City Magazine, November 4, 1975)—risking fearsome retribution from Lillian Hellman who was, up to that point, successful in keeping Jose away from reporters and potential biographers. At least at the beginning of his career, Fechheimer fit that bill. And then there is that matter of Spade never getting paid. That’s just flat out wrong. As a matter of fact, Spade and Archer get paid right up front for the Falcon job—Brigid gives them $200 in the opening chapter, which leads a couple of chapters later to one of my favorite lines in the book. After Miles is killed (I trust this is not a spoiler for anyone here on the Mean Streets), Brigid confesses to Spade that her story was just that, a story. Back in 1929 that was a good pay check for three day’s work—Spade’s share would amount to nearly $1,500 in today’s dollars—and knowing Sam, he probably kept Archer’s share. Fechheimer was right about sleeping with the client—a bad, even unethical, move. But without that moral slip we wouldn’t have that powerful final scene between Sam and Brigid where he tells her he won’t play the sap for her. In the end Hammett was writing a novel not a biography. So opines Terry. He could have mentioned the scene in the Coronet where Spade takes a big roll of cash off Brigid and tells her that if she needs day-to-day folding money, she can pawn her jewelry. He takes $10,000 off the Fat Man, and but for circumstances might well have kept it. No, Sam Spade got paid. Maybe Fechheimer conflated him at that moment with Philip Marlowe. . . .
Just heard from Terry Zobeck, who heard it from Larry Block, who must read the New York Times, that David Fechheimer died April 2 at the age of 76 — reportedly from complications after open heart surgery. Once again, ouch. Brings it all forcibly back to mind. In the pic above l. to r. you have me, Fechheimer and Nathan Ward, from a Hammett deal we did in the Mechanics’ Library. Pretty sure that was the last time I saw Fechheimer. I’d spot him on the street occasionally. Many years ago when the tour kicked off from the old Main Library in 200 Larkin I noticed him coming out the doors and pointed him out to the group as one of the main and certainly most important researchers into Hammett’s life. He did that detective thing of turning his face away and moving off — as opposed to coming over and saying Hi to the crowd — because detectives don’t want too many if any people recognizing them. I understood. No offense taken. In more recent years I especially recall bumping into him once near 4th and Mission, where he told me he had a ticket to a performance by Ken Nordine (believe Fechheimer referred to him as “the first rap artist”) in the Yerba Buena Arts Center — but for some reason he couldn’t use the ticket and urged me to see the show. And so I did. Expanded my cultural horizons. The way I look at it, when Fechheimer’s old boss Hal Lipset was alive, he was the most famous real detective in San Francisco (nobody is going to ace out Sam Spade overall). When he died, then Fechheimer took the title. I always enjoyed seeing him and hearing the occasional story, such as the time he and another prominent detective — then young guys — hit a remote compound to rescue a kid whose rich father had abducted him in a custody dispute. When the other op didn’t make it back to the helicopter in time, Fechheimer left him behind and he had to walk out. Hard-boiled. I don’t know how many obscure tidbits of Arkham House collecting lore Paul Dobish is privy to, but I’ll bet it’s more than you or me or the average joe walking down the street. The average joe might dream of assembling a complete collection of Arkham books from 1939 to date. And this generic joe might well gather all the books, after years of searching and plenty of pazoors dropped down the rathole. But would such an imaginary being be able to amass a complete collection of Arkham ephemera? Would he, like one guy I know, collect each Arkham House release signed by the author that could be signed by the author? Would this would-be collector have ever heard of the Shorty Dunwichs? I think you have to be a deep-diver to have heard of the Shorty Dunwichs, but I know John D. Haefele plans to cover them in his upcoming August Derleth of Arkham House. He was in on the quest to seek them out with the late great Arkham collector Richard Jefts — Jefts filled notebooks with data and measurements of the Shorties. But back to Dobish. 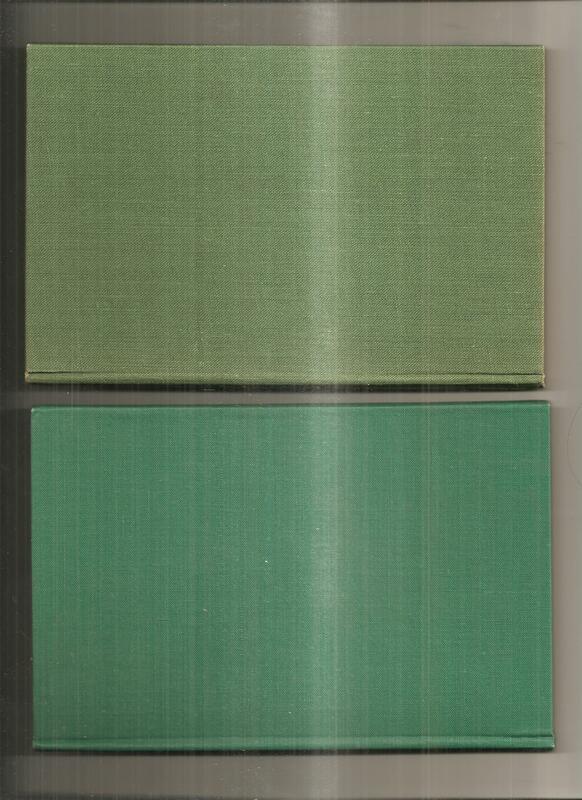 He dropped the info on this site that the Stanley McNail poetry collection Something Breathing is bound in two distinct shades of green cloth. I’d never heard about that variation. Consider that his Arkham Arch-Collectors tidbit numero uno. Now he returns with more info I hadn’t heard about — dustjackets on two early Arkham releases printed on white, rather than colored, paper. Clark Ashton Smith’s Lost Worlds (Arkham no. 7) and Derleth’s Someone in the Dark (Arkham no. 2). Dobish reports, “A previous seller of the Lost Worlds Dust Wrapper had described it as being a unique proof. Either/both DWs could be that, or something else. (And not necessarily the same thing for both DWs). “The reverse side of each DW is completely blank. The paper stock of each is of a similar ‘reasonable’ thickness (that is, not unduly flimsy). “I am not certain as to their true nature. However — particularly as there is an example of two different titles rather than just a single title — I strongly suspect that they are trial/test Dust Wrappers of some sort. Perhaps less for color choice, a la the black/blue/green Outsider trial Dust Wrappers, than for higher contrast to better check the quality of the printed art/text. Got that? The translation is that if you must have each and every possible permutation of every Arkham title, you now need to track down the white-paper dustjackets on Lost Worlds and Someone in the Dark, and keep an eye peeled for any other white-paper jackets on other Arkhams of that bygone era. I’ve got the first of Lost Worlds, and can tell you that the jacket ought to be on a blue or greenish-blue paper. Age and sunning have had their way with many of these books — Don Wandrei’s The Eye and the Finger (Arkham no. 5) is in a solidly green jacket, but if sunned for years it might register to the eye as more brown than not. A couple of detail scans included — not the best scans, but they’ll give you the idea. I was deeply saddened by news of Wilum Pugmire’s death. I never met him in person, but know people who did — an individual whose company they enjoyed, who happily shared the knowledge he’d gained in his chosen literary field. For a while — and at the same time — Wilum and I were members of the Esoteric Order of Dagon, the amateur press association devoted to our author-favorite, H. P. Lovecraft — who was his especial interest. I don’t remember that his journals in that venue stood out to me, except that he unabashedly demonstrated admiration for August Derleth — my own especial interest. Several uneventful years passed. But I did learn something about Wilum’s generosity when out of the blue he sent me a book — gratis — I needed to complete a project I was working on. More years passed, and I found myself completing the first draft of A Look Behind the Derleth Mythos: Origins of the Cthulhu Mythos. It occurred to me that because of his sustained interests, and sudden, emerging status as a weird tale writer, Wilum would be the perfect choice to write an introduction. I will always treasure Wilum’s subsequent remarks to me about Joshi’s review. The month of March adds another death to its grim stats with the passing at age 67 of Wilum Hopfrog Pugmire, May 3 1951-March 26 2019. Got to give him a mention here if only because of his introduction to the first edition hardcover of John D. Haefele’s A Look Behind the Derleth Mythos, an intro carried on into the second edition trade paperback, but, in deference to The Pug’s legend, omitted from the third edition eBook. Pugmire above all seemed to carry the lore of a book-book guy, a fellow of limited and curiously quaint print runs, a lurker in signed editions of one hundred copies. That sort of thing. A truly fine intro, let it be said, to the best book ever done on the Cthulhu Mythos. Pugmire himself was most associated with the modern Mythos, that cadre of writers who emerged from the fanzines and fanfic of the 1970s. I first heard rumor of him circa 1974 because he had a job of sorts where he got to dress up as Lon Chaney in the lost film London After Midnight. I thought then — and still think now — that such an unusual gig is very cool, and nothing less than a triumph to even create. I can see myself as a guide on night tours of the Winchester Mystery House, but only if I got to pay tribute to Chaney, too. Cape, top hat and teeth, please. . . .
Count Pugsly, that was his undercover moniker. He branched out into other guises and adopted identities, ultimately posing as an eldritch drag queen — but perhaps that wasn’t a pose. I was thinking his YouTube channel had hundreds of vids on it, and so it does. If interested, probably the easiest way to access the Pug-o-sphere. While I’ve known of Pugmire all these years, and we operated on the borders of a common nyctaloptic nexus, I only met him once, when I stopped in on some horror convention in San Francisco. He seemed like a mild-mannered guy, despite the fact that his face was painted green or other bright and untoward color. Doing a quick check of the net, it looks as if Lawrence Ferlinghetti turns 100 years old today. The event could have slipped past my radar, except a few days ago I got a deluxe one-sheet poem from D. S. Black titled “For Lawrence Upon a Century” all about “a library of insurgency” and I thought, hey, is the century mark coming up? I checked, and so it was. Last year about this time my pal the poet Donald Sidney-Fryer asked me for some reason if Ferlinghetti and Nancy Peters, both of City Lights, were alive. That day, who could say? So I hopped on the net and to the best of its tentacled ability the answer seemed to be yes. I told DSF, based on the info uncovered, that Ferlinghetti would be 99 in a couple of days. 99 seemed like a lot, but 100 is more. DSF just wrote again — a real, old-time, stamped letter — to report that he’d just had a full physical — including an “electrocardiac exam wid all dem wires and t’ings” — and at the age of 84 is “astonishingly HEALTHY”. . . .
Could it be that I have met at least two poets who have cracked or might crack one hundred big ones? Hard to believe it was ten years ago today when Steve Tompkins punched his ticket. Only 48 years old, hospitalized for food poisoning after hitting Burger King, then out of the blue a heart attack. If they can’t handle a heart attack when you’re already in the hospital, game over. Some people talked at the time, as they will, of assembling a memorial collection of Tompk’s major essays, but that didn’t happen. And I can say that it doesn’t really matter, because most of those essays appeared in venues that are still current — such as my The Barbaric Triumph, now part of an eBook LitCrit MegaPack on Amazon —- or as intro or afterword matter to the Del Rey trade paperbacks of Robert E. Howard. Even if those fall out of print, enough copies saw print to satisfy the Tompkins-collecting needs of a generation or two of new fans. I think of Steve fairly often, most stridently earlier this year when I stumbled across the documentary Sad Hill Unearthed on Netflix. Starts a little slow, ten minutes or so, then becomes one of the best docs I’ve ever seen. As you know, I’m a fan of The Good, the Bad, and the Ugly, but Tompk was a complete nut on the subject. Every few minutes I’d think, Man, if only Tompk could see this! — he’d love it! One of the first things I noticed about Steve Tompkins was his objection, expressed mildly enough, as were most of his objections, to the term legendary — at least in the way I tossed it about in blurbs: Glenn Lord’s legendary fanzine The Howard Collector, my legendary essay “Conan vs. Conantics,” that sort of thing. I was just having fun, but Tompk apparently wanted legendary to apply to the old time legends of yesteryear, when legends of all kinds are cinched up and ridden into the sunset every day. Without question, I suspect Steve has the best chance of any Howard critic to date of becoming an actual urban legend. He was riding the subway in New York post 9/11 when a couple of Homeland Security ops came by conducting a random search of bags and backpacks. On most days, no problem, but in his backpack Steve had a sinister-looking helmeted skull courtesy one of his essays winning a Cimmerian Award. As it emerged from the bag, the ops viewed the grim totemic trophy with immediate suspicion. What the hell was it? 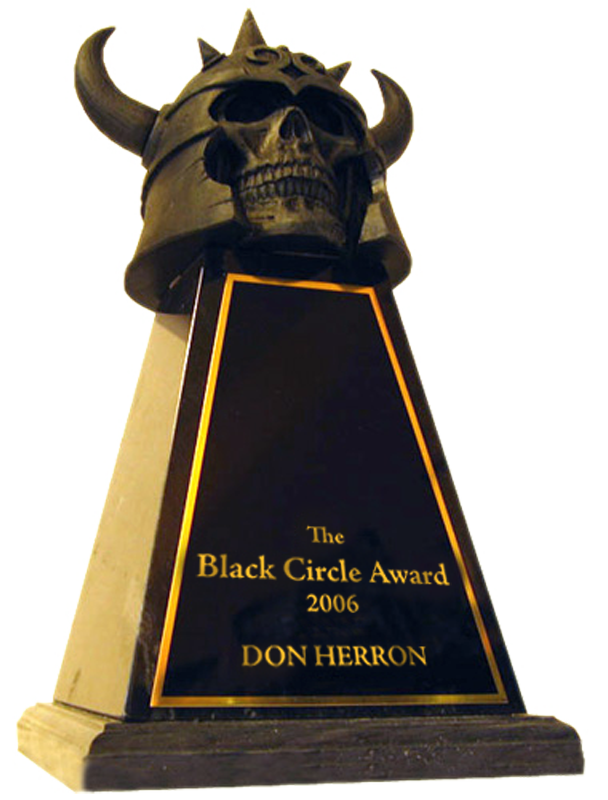 Trapped, in one of the very few situations where winning an award for best Howard essay doesn’t sound all that great any more, Steve tried to think of something that would explain it — uh, Robert E. Howard, Conan. . . . Wait, one of the security ops said, you mean like Frazetta? Steve jumped on the opening. Yeah! Like Frazetta! Tompk had the makings of a legend the first time he came into my sphere. 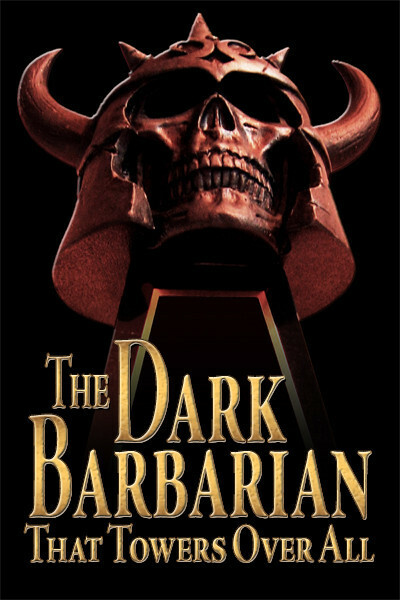 I had been talked by Ed Waterman and Leo Grin into editing another critical anthology on Howard to follow The Dark Barbarian, and Leo was pushing Steve hard for the lineup in what would become The Barbaric Triumph. In REHupa Tompkins already was notorious for doing fifty and one hundred page zines, starting one survey after another that would ebb away after two or three parts as he hopped over to another subject, then another — one front quote for a header wouldn’t do if he could use six or ten, maybe a couple of those in German. Editing the erupting wordage was brutal, but Steve finally gave me something close to what I wanted out of him. And he was by no means the only essayist I was beating heavily with a stick as the book avalanched toward the finish line — it was in that frantic period that I coined the nickname “Tompk” as a timesaver since I had both Steve Tompkins and Steve Trout plugging away, just referring to “Steve” wasn’t clear, and I realized a five-letter limit made it all even. Leo later paid the price for promoting Tompk when he launched The Cimmerian and got to edit one monstrous amorphous essay after another over the five-year run. I recall looking at one which began with a line that referenced three or four things, dropping the title Appointment in Shannara — obviously punning off the John O’Hara novel Appointment in Samarra with reference to the Terry Brooks fantasy series. I understood the refs, of course, but still read along in absolute disbelief as Steve spun his wheels for four or five pages without ever getting to the point, if there was a point. I freely admit that I find his unedited essays almost impossible to read, a real chore, and only skim around in them looking for nuggets — in particular, his “Mind-forg’d Manacles?” in a recent issue of The Dark Man is one of the worst train wrecks I’ve ever seen, jumbled-up mounds of verbiage randomly littering the landscape. Perhaps naively, I always hoped that Tompk would get to the point where he’d drop the needless excesses, but for every piece edited in blood by Leo next up Steve would trot out some intro or afterword for a Del Rey book in which he quoted everything he could think of — the Kitchen Sink Gone Wild approach. What the hell. I suppose we all do what we can do, and I admit I had some fun with Steve for a few years by threatening to get him a gig reviewing for Publishers Weekly, where the total word count for everything, author, title, price, the whole review, was under two hundred words — less than a typical Tompk sentence or two! I told Steve, think of it as akin to writing a haiku. . . . I told him I’d call him up, talk him through the first couple of reviews. . . . Man. The very idea of Steve writing less than two hundred words. He would have exploded. I did convince Steve to do one shorter item, his piece in The Cimmerian where he discovered that George Orwell had read some of Robert E. Howard’s boxing yarns. What a dazzling piece of detective work, a discovery which really helped amp up Howard’s centennial year. Leo told me that Steve had the info buried in one of his long rambling essays, and I thought immediately that the significance of the find might get lost — worse, what if someone else stumbled across it while the longer essay waited to see print? Tompk was first to notice, and deserved all the credit. While I never got to meet Steve, I called him from my cell quite often, usually on Sundays when he’d be holed up in his lair in Brooklyn and I’d be driving into San Francisco to do the Dashiell Hammett Tour. He’d often ask for firsthand stories about Fritz Leiber, and we’d sometimes talk politics — what a great double-whammy moment it was when I spotted the Cheney/Voldemort bumper sticker on the freeway! I sincerely regret that Steve won’t be around to sit in on the Circus Maximus if Sarah Palin runs for president next time. Despite what some might have you believe, not all Robert E. Howard fans are conservatives. On the liberal side you can count me and Steve — and also Howard’s major successor, Fritz Leiber. Sometimes we’d talk about a potential third critical anthology I had in mind on Howard, where Tompk stood ready to contribute, no doubt in pitched combat against every editorial wish I might have, but we’d have worked it out. He told me he’d been saving up his ideas on Howard’s Crusader tales for that project. Just think, Steve Tompkins on the Crusader cycle, forced to the wall by someone getting him to hone the words to a sharp edge — it would have added another deep notch to his legend. Maybe not today, maybe not tomorrow, but soon — and who knows?, maybe for the rest of your life — the Some Media clump in the banner above is going to disappear. Every few years I dink around with the website, spruce up the sidebar, check to see if links on major items are still alive. And most of the TV and radio links have gone dead — or maybe they’re still out there someplace on the net, for people patient enough to track them down. I consider most media ephemeral, but if an interview pops up I’ll give notice. Just scurry over fast before it disappears. One of the print/online articles I liked was the review in the Wall Street Journal by Tom Nolan on December 4, 2009, covering Xmas Gift Books. As you can see from the image at top, the most recent tour book made the cut. You can still get to his article, but to read more than the first couple of paragraphs you need to sign up. Shortly after that one the walk was blurbed in USA Today for December 18, 2009 by no less than Otto Penzler, whose personal collection has gone on the block recently. $75,000 for the first edition of Red Harvest. Wowza. But 2009 was a decade ago (nothing in the 40-plus year history of the Hammett Tour, but a long time for most things), so it’s time to move on. As it turned out, the first installment of my short-lived review column for Lit, a literary supplement for The San Francisco Bay Guardian, hit print in May 1995 — timing that allowed me to wrap up the piece with a tribute to a pal of mine. To confess I had simply died in my sleep. Thus wrote I, back in the day. Everybody in our circle of horror devotees felt that Stan had shorted us, dying at 77, when his dad was still alive at the time and in his 90s. Stan did have a heart attack in the night in his room — 1630 University Ave suite 42 (the windows just over main doorway) — and was found lying on the floor. Perhaps that detail adds frisson to the poem quoted above. Today is the 101st anniversary of his birth. If I’d been on my toes this time last year— and not dying, as it were, from congestive heart failure — I could have commemorated the 100th Big One. But even if I hadn’t been distracted, most likely I wouldn’t have thought of it. Few hard details about Stan’s life are available online or in the so-called “standard” reference sources, so it’s not easy to summon up his birthday. Until now. I only thought to look for the date after Paul Dobish, one of my Arkham ephemera collecting pals (you’ll find him cited in my article on the subject in Firsts), brought an interesting collectors detail about the Arkham House first of Something Breathing to my attention. I figured, yeah, cool, people need to know about that — might make a good excuse for a blog post on a birth or death day. Now, when exactly was he born? I dug the birthday out of the file on Stan kept by Steve Eng, which somehow ended up in my hands. Steve was the main guy, and certainly the most talented, to begin serious surveying of horror and fantastic poetry. In effect, he was the equivalent of Dirk Mosig, the major figure to kick off modern Lovecraft scholarship and criticism. More pedestrian pundits have carried on their work. Stanley Duane McNail was born March 14, 1918 in Centralia, Illinois — the spelling of the name had been changed from the traditional McNeil. He moved to San Francisco by the early 1950s (I was sure of 1953 when I did my obit, but you can fudge the info if you want — in 1953 he would have been 35 years old). I knew that Stan had worked for Greyhound for a long time — in management, I’m pretty sure, not driving a bus. His obit in the San Francisco Chronicle states he held down that post “for 15 years, retiring in 1983.” So, if correct, 1968-1983 — for many of those years and afterward he kept a room in 525 Hyde Street off Geary. He relocated to Berkeley in 1986. While the Arkham edition of Something Breathing — usually tagged between $150 and $300 on the o.p. market — is his obvious major claim to fame, and most likely the toehold that keeps Stan on that sheer cliff-face of immortality, I wouldn’t count out his poetry journal The Galley Sail Review just yet. He began the little magazine in 1958 and continued until 1971 — then revived it, so that it appeared sporadically for 37 years. Early poems by Bukowski, some of The Beats, and hundreds more. One anecdote Stan told me about the poetry scene in North Beach in that hothouse era of the late fifties/early sixties as the Beats were coming to dominate the scene (pushing the Activists and others firmly to the side) was an ongoing feud of some sort he was having with the poet Jack Spicer. Both Spicer and Stan were gay men. Spotting Spicer in a bar frequented by poets, Stan walked over and planted a kiss firmly on his mouth. But to give this celebration of Stan McNail a bit more oomph, let’s get into the dope noticed by Paul Dobish. Arkham House collectors are going to like this one. How often do you get any new collectors info on books from Arkham? In Thirty Years of Arkham House the print run on Something Breathing from 1965 was recorded by August Derleth as only 500 hardcover copies. One of the few Arkham titles printed by Villiers in England, using green cloth for the boards instead of the usual Holliston Black Novelex so familiar to fans of the press. In the course of running his Other Worlds bookstore, Paul Dobish saw several copies of Something Breathing pass through his hands. “As both a collector and bookseller,” Dobish reports, “I would compare multiples when I had them to see which copy I wanted to keep as a collector and which to put up for sale as a bookseller. In short, Arkham collectors — and especially for the completists who must have each and every permutation of items from the press — Something Breathing is bound in two distinctly different shades of green. At least. Dobish says, “I do not know how many were bound in one shade versus the other shade. It is also possible that there are more than two shades, although my guess would be that there are not. “One — let’s call it pine — I would say is more of a green-green. The other —olive-ish — I would describe as more ‘muddy’, that is towards being a brown-green rather than a green-green. Scans are imperfect enough it might be hard to get the idea across. It’s not as if one cloth is green and one purple. Both green. But let’s give it a shot. At top the “muddy” or subdued green — that’s what I have on my copy. The bottom is the more vibrant, more “Irish” green.